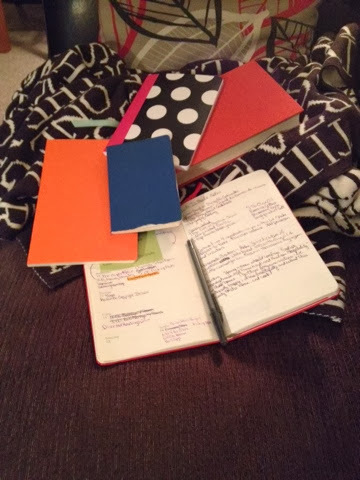 I know I am not the only one who takes notes while they read and I'm probably not the only one who does so in a variety of formats. With non-fiction, I like to use a physical notebook instead of reacting to what I am reading within the confines of the covers. (Though I am working to develop the habit of copying favorite quotes into a notebook) I think I do this because items in non-fiction are likely to be useful in real life and having to run back to the page is just more difficult. These notebooks create a record of what interests me and when. So I collect things in notebooks. Usually I provide a citation of sorts, like the title, though not always the page number, which I am sure will prove to be problematic at some point in time, but I'll let future Lori worry about that. The polka dot notebook is to be used for writing down quotes from books I read. It's a good size notebook to keep on the side table in the living room or on my nightstand. I just need to start actually copying things down...When is a good time for that? Once I'm done with the novel? Immediately? At the end of the day? The little blue notebook resides in my purse (even if I'm carrying just a clutch for an evening out, I always have my blue notebook and a pen, along with my license, cards, and emergency cash). It's the perfect size for jotting down anything I feel is important--phone numbers, recipes, menus, etc. It's become such a fixture that I feel odd going out without it. I used to carry a black one that flipped up instead of over. I miss that one--it made me feel like a journalist! The orange notebook is a brand new one. I got the idea from the book I'm reading--Life Is Meals by James and Kay Salter (which is the red book you see at the top of the photograph). The Salters have been compiling notes from their cooking experiences for years. They have recipes and notes on the recipes--variations, to whom they served it and their reactions, wine pairings, and so on. I loved this idea! I grabbed one of my spare notebooks immediately and wrote down the recipe for a Low Country Boil (using Old Bay, crab legs, and shrimp) that we made on Wednesday, along with the variation we were going to attempt last night (using Cajun seasoning, sausage, and crawfish). I need to update it, now that I mention it. I've been looking for a way to compile all of the tried and true recipes that I really like and I think I am going to switch directions and do this. It feels more personal than a binder. The open notebook is actually my planner. I chose this one in particular because it has the days of the week on the lefthand page so I can write down my to-do lists and appointments and the righthand page is lined so I can write down anything. I've used these pages to write down quotes, plan projects and parties, recipes, and currently my notes from Life Is Meals. I have no idea what the future of these notebooks will be. Maybe someday I'll be a fabulous freelance writer and can organize, flesh out, and publish a couple of these notebooks as books. But for right now they are helpful tools that aid me in collecting the information that is important to me. Do you have any notebooks going? What do you keep in them? Also--do you have any ideas for how I can solve my quandary about copying quotes from novels into a notebook? Ahhh . . . another notebook lover! I keep a few of notebooks: one for quotes, one for general lists, and then there's the one that I used to use for my TBR list until I just recently made the move over to Goodreads. I've had that notebook for over 20 years, and I'll never get rid of it. It's so interesting to look through it once in awhile and see how my reading tastes (and handwriting!) have changed over the years. For my quote notebook--I usually will either write the page number of the quote on the inside cover of the book--or (gasp!) dog-ear the page--and then when I'm done reading for the day I'll go back and copy it into my notebook. I don't like to interrupt my actual reading to do so, but if I wait to long I forget about it. I use two notebooks for reading but I have tons stuffed into my desk because I can't seem to say no to notebooks. I have one that I use for book quotes, but like you I often forget to update it while I'm reading and then once I'm done. I need to come up with a better system so I'm not flipping through a book on my kindle trying to track down which quote I liked (I almost never use the highlight function). Then my other notebook is for book notes for any book I'm thinking about reviewing on the blog. I write down all the things for the bare bones post like number pages, publisher, etc. and then my reactions, questions and overall feelings. I also have a tiny fat notebook for all the books I want to borrow from the library. I just started up my sticky note habit again (see this post) but maybe these little note books are better. Might have to try it. I've wanted to keep a quote book forever, but never had. Maybe I'll finally start that! Also, where did you get the planner with the lines on one side? That sounds so very handy. I admit I don't like writing in books, and only do so for textbooks (and if I didn't write in them I'd fail my classes). My planner is from Moleskine, which is actually having a sale on planners right now. I really need to start taking notes!! I've begun a few journal but then I just forget xD Lovely post! I'm a huge notebook fan. I keep one for records of what I read each month (I use Goodreads too, but I like flipping through the pages). I also keep a quote book-I generally finish a couple of books and then go through to update it. I also keep a "to-do list" notebook. I create lists of tasks-generally work related-for the week and work my way through them. It keeps me organized and on track! I keep a day planner as a back up to the one I keep on my phone and write in a personal journal. I like the idea of keeping a journal for book quotes- so often I'll reading something and think "damn, that's good! I'll have to remember that for later" and then I don't. I have quite a collection of purple notebooks that I use to document my info. Purple is my favorite color. I have a Quotes notebook, a notebook where I log in the free books I download on my Kindle another notebook where I log in book (hardback and paperback) titles that I want to read. I write notes on the various books that I read on note cards and then transfer them into the Books read notebook. I never thought of keeping a notebook around when I was reading, especially with library books, that is an awesome idea. I send myself emails when I am reading ebooks but I think I will have to invest in a sweet little notebook just for this reason! I copy my quotes from books onto 3x5 cards, then punch a whole in them and bind them with a ring. But I also have notebooks: a food journal, a journal of my life, a spiritual notebook and a notebook I write blog ideas and a notebook of things I need to do, budget, appointments. Oh, I fogot I also keep a journal of books I read each year. Yep, I do this as an author. While I'm reading I highlight examples of POV or historical facts I want to remember or a scene that made me laugh or cry. Glad to know I'm not alone playing the 'student' while I read. I am starting one for the books I read (as I finish them) to record my thoughts. I can't get on the computer as soon as I'm done with a book and I won't wait to start the next book. This way, I will be able to remember character names, my thoughts, and anything else important when I go to write a review for the blog. I bought it at Barnes & Noble yesterday. It's 8/12x11 and a robin's egg blue. I think it's supposed to be comparable to a Moleskine but it really isn't. :) It works for my purposes though! I love the ideas of note books! I haven't started one yet. Well, except for a note book for my future wedding... but I don't think that's the same thing. One day I might. Right now my note book is used as a Journal for personal thoughts. I love notebooks and use them for the most random things in my life. However. I REALLY need a notebook to write my thoughts on books as I am reading them. Since I am reading more books, more frequently and not reviewing until down the line.. sometimes I forget parts I wanted to mention in my review. It is quite frustrating. I also need a notebook calendar. I don't use them at all but that small book that you carry around with you is a really great idea! A fellow notebook user here! I have multiple notebooks/planners for various uses. It doesn't really make me feel organized, but it does help clear my head sometimes!